Trulli del Bosco is an enchanted village between skies, woodlands and stone-paved trails just 2 minutes from the Alberobello Trulli Zone (UNESCO World Heritage). A place to stop by, to escape from the noise, rest one’s body and regain oneself. The village consists of four Trulli with swimming pool, stretching between two hills dotted with olive and fruit trees, on the verge of “Bosco Selva”: an oak forest, covering 45 acres and full of guided tours for trekking and mountain biking. The entire inhabited rocky lands, since the eighteenth century was the residence of four peasant families, today it is an example of respectful restoration and maintenance of the landscape. Each trullo hosts up to four people and the entire facility has a capacity of 15 beds. Each trullo is equipped with all modern comforts, in order to experience the holiday in complete and autonomous relaxation. The interior consists of original-domed alcoves with double beds, a bathroom and a living room equipped with kitchenette (including pots, plates, dishes and even our own homemade oil). Also included is a refrigerator, electric oven, all necessary accessories for the kitchen, plasma TV and heaters for the winter. Exterior: Guests can enjoy the summer by taking a dip in the pool amongst almond trees and laurels, dining freely under the gazebo right in front of their trullo. And if they want to slowly explore the territory, free bicycles are available. Also, the amplitude of the landscape around the village will give way for the enjoyment of children and families for long walks along the paths/trails, with the possibility of friendly encounters with donkeys, horses, sheep and other domestic animals. 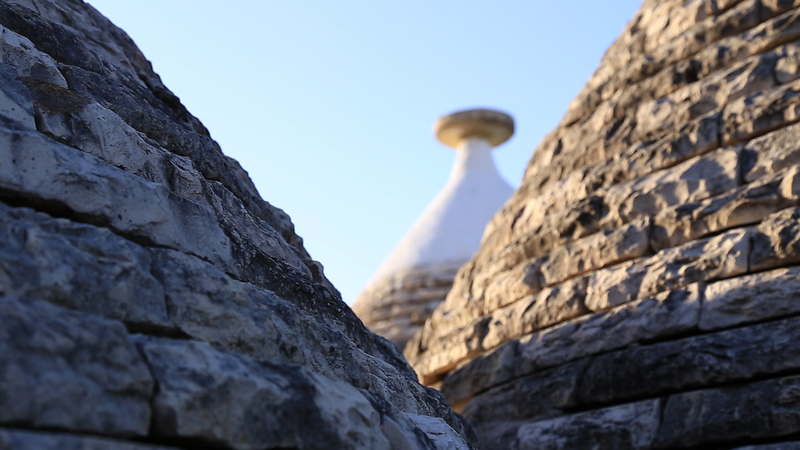 Trulli del bosco is also a place for holidays aimed at slow tourism, eco-friendly and healthy. For this reason we offer our bicycles free of charge, we organize organic and homemade cooking courses and we also plan guided tours on foot or by bicycle. Trullo di Columbro: sleeps 4 = one double-bed and one double sofa-bed . Trullo di nonno Pietro: sleeps 3 = one double-bed and one single bed . Together with us, you can immerse yourself in a true Apulian culture, savoring homemade meals and organics from our gardens, learning to make the orecchiette pasta with granny, walks or bicycle rides through the countryside, farms and the white hamlets of Valle D’Itria.